Back from the Brink or Still in Trouble? 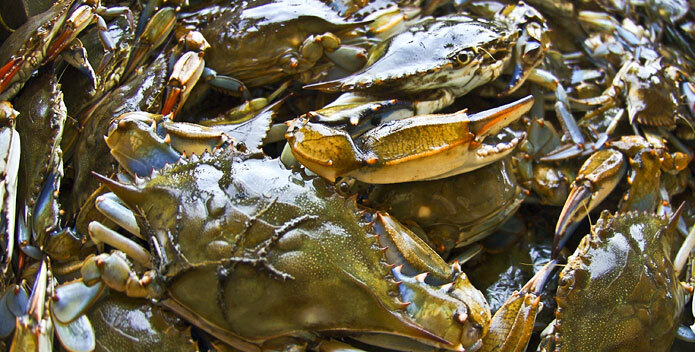 A bushel of lively blue crabs is a common sign of summer around Chesapeake Bay. The fact that we can't control Mother Nature makes it even more imperative that we focus on the elements we can control, especially reducing pollution to the Bay and maintaining sufficient numbers of spawning-age crabs. 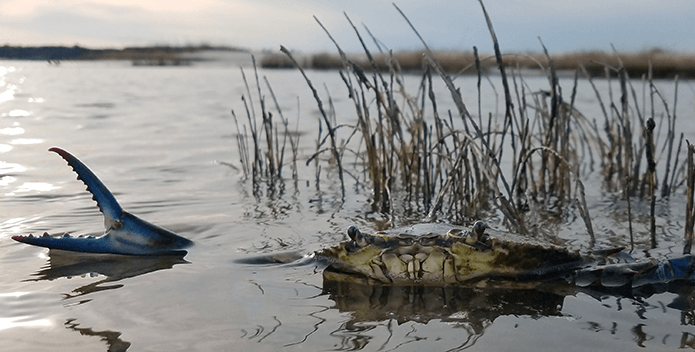 Known as "beautiful swimmer," the blue crab is one of the more resilient of Chesapeake Bay species, but it faces constant challenges to survive: predators, dead zones of low oxygen, vanishing habitat, and at times cold winters, to name a few. Proactive scientific management of the crab population has been critical to ensuring their survival. Cleaner water and improved habitat also will help crabs. Reducing the levels of nutrients reaching the Bay from farms and lawns, and better managing polluted runoff before it gets into rivers and streams, will help mitigate weather extremes, improve water quality, and contribute to the recovery of both blue crabs and Bay grasses. Years ago, crabs lived a less harried existence in the Bay. They didn’t face the same harvest pressure. But with the drastic decline of the Bay's oysters in the 1980s, watermen began extending their crabbing efforts much later into the fall, the time they normally would have shifted to oystering. A decade or so later, the crab population had been cut in half to around 300 million. Not only was the blue crab itself depleted, so too were the oyster reefs and underwater grasses that provide it with food, shelter, and oxygen. New science-based guidelines were established in 2008, focusing on a reduction of the catch of female crabs in order to ensure sufficient spawning. Within two years, the population had doubled and watermen and fisheries scientists were hopeful the population was coming back from the brink. But in 2013, survey numbers dropped back to 300 million. In 2011 a recommended target of 215 million spawning age female crabs and a threshold of 70 million were adopted by Maryland, Virginia, and the Potomac River Fisheries Commission. The 2018 winter dredge survey found the abundance of these females was below the recommended target but well above safe levels. This survey placed the total number of crabs in the Bay at 371 million, down from 455 million. 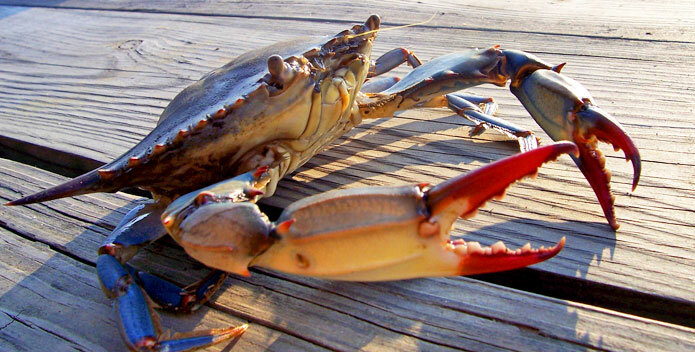 Find out more about the state of today's blue crab fishery. The Bay's blue crab population has always been prone to fluctuation, but it is clear it would be strengthened by improved water quality and crab habitat. Reducing the levels of nutrients reaching the Bay from farms and lawns and better managing stormwater runoff before it gets into rivers and streams, will help mitigate weather extremes, improve water quality, and contribute to the recovery of both blue crabs and Bay grasses. The crab population is truncated, meaning we catch crabs so quickly there are very few crabs left bigger than legal size. As a result, the fishery is very dependent on the survival of young crabs from one year to the next. That creates instability, as the population may fluctuate significantly from year to year or even from one part of the season to another. These fluctuations are not a good thing for the crabs or the crabbers. Having more older crabs in the crab population increases the reproductive potential—which helps stabilize the population even when weather conditions or other factors are not prime for reproductive success. Larger crabs on average are also the most valuable in the market, and therefore result in better economic returns for the crabber. 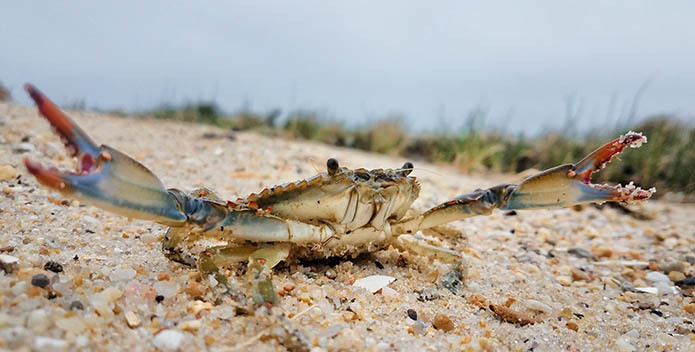 Essential for building stability in the crab population is for Maryland and Virginia to continue applying the science-based guidelines for managing the fishery adopted in 2008, which have helped to avoid the overfishing of previous years. "The blue crab was really affected most by overexploitation by fishing," said Dr. Thomas Miller, Director of the Chesapeake Biological Lab. "A decade ago, they were experiencing 70 percent removal rates. And you can't take 70 percent of the trees and still have a forest. And if you take 70 percent of the crabs, you no longer have a healthy crab stock." It is clear the Bay's blue crab population would be strengthened by improved water quality and crab habitat. Reducing the levels of nutrients reaching the Bay from farms and lawns and better managing stormwater runoff before it gets into rivers and streams, will help mitigate weather extremes, improve water quality, and contribute to the recovery of both blue crabs and Bay grasses. 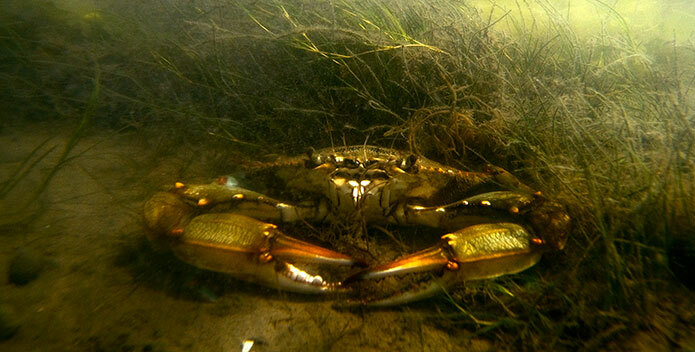 The Fight to Shrink "Dead Zones"
Another strategy to improve the long-term stability and health of the Chesapeake's crab populations is to cut significantly the nitrogen and phosphorus pollution into the Bay. Nitrogen and phosphorus stimulate explosive growth of algae. Algal blooms darken the water, blocking light and killing underwater grasses that crabs need for shelter. Algal blooms fed by polluted runoff quickly die and decay, sucking up oxygen and creating "dead zones." 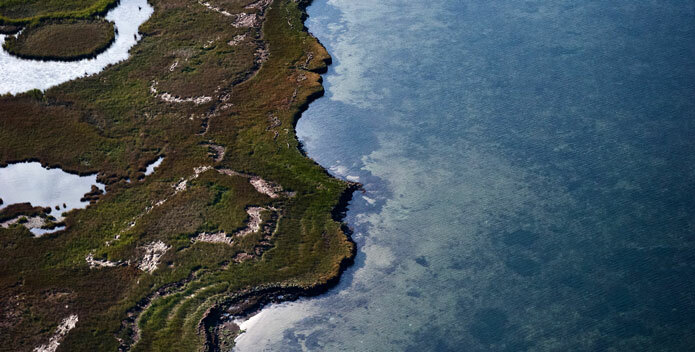 The dead zones force crabs to find oxygen in shallow waters where they are more easily caught. Dead zones also kill the food that crabs eat, destroying or preventing the growth of 75,000 metric tons of clams and worms a year in the estuary, according to a scientific study in the journal Science. That is enough food to support half the commercial crab harvest. In an effort to shrink the Bay's dead zones, the U.S. Environmental Protection Agency issued pollution targets for the Chesapeake Bay in December 2010, resulting in the cooperative efforts of federal and state agencies in what is called the Chesapeake Clean Water Blueprint. At the center of this effort are blue crabs and the more than 6,000 watermen and other workers who depend on the crabs for their livelihoods. Photo of the Week: En Garde! A blue crab prepares for battle in Northumberland County Virginia. 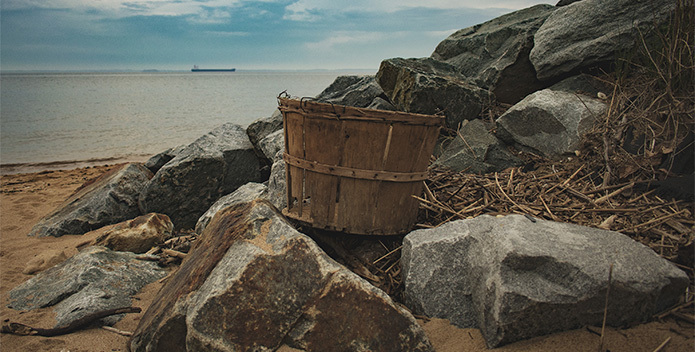 Since 1998, CBF's State of the Bay report has been tracking the health of the Chesapeake Bay and providing insight into the progress—or lack thereof—being made. 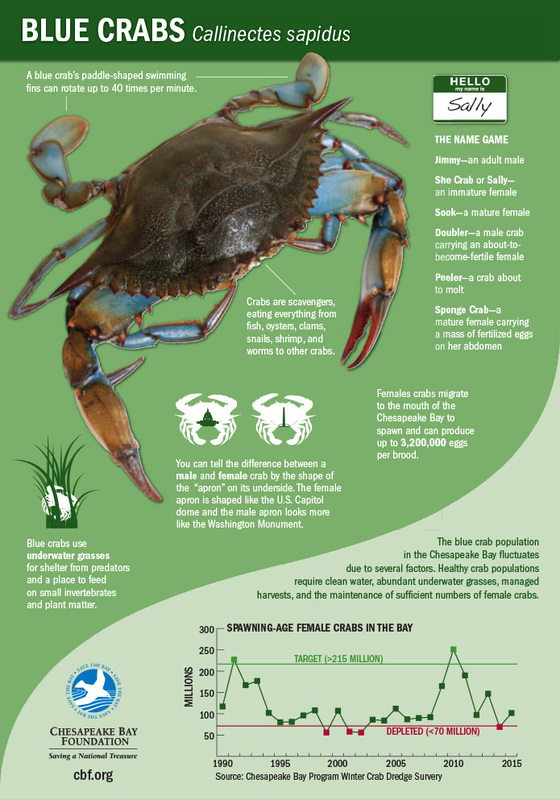 Learn more about the Chesapeake Bay's blue crab, the threats it faces, and why it is so important to the health of our Bay. Photo of the Week: We Send Greetings! A beautiful day at Hughlett Point Nature Preserve was made even nicer by a huge flock of pelicans arriving, a waving crab, and fishing for over 2 hours!